Aston Martin CEO Andy Palmer with the DBX crossover concept at the Geneva motor show. 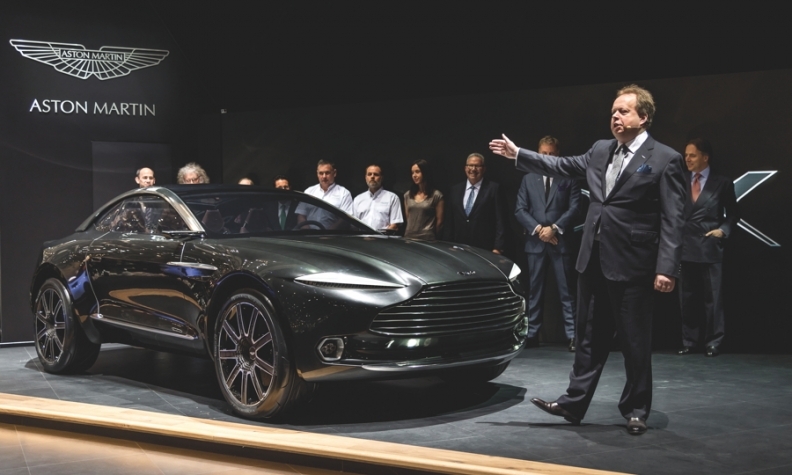 Aston Martin Lagonda is set to receive more than $300 million for the development of its groundbreaking DBX crossover and other vehicles that fall outside its traditional sports car bent. The company has raised 200 million pounds -- roughly $307 million at today’s exchange rate -- from two batches of new preferred shares from Aston’s two majority shareholders, Investindustrial and Tejara Capital. The first half of the investment came on April 29; the second half will be issued over the next 12 months, the company reported. “The additional investment announced today will allow us to realize the DBX and other new luxury vehicles that will form the strongest and most diverse portfolio in our history,” Aston Martin’s CEO Andy Palmer said in a statement. The DBX is a concept crossover the automaker introduced at the Geneva Motor Show in March. It is expected to go on sale around 2019 and is aimed at pulling more women and younger buyers into the Aston brand, which has traditionally relied on a small, male audience. Aston also plans to use the additional funds to develop a long-wheelbase sedan aimed primarily at the Chinese market, where wealthy buyers prefer to be driven rather than drive. By broadening its customer base and entering into more profitable vehicle segments, Aston hopes to become self sufficient rather than relying on cash infusions from investors. The company also plans to overhaul its entire sports car lineup by the end of the decade. Mercedes-Benz’s parent company Daimler owns a 5 percent stake in Aston and as part of that deal is working with the British automaker on a turbocharged V-8 engine and an electrical architecture for future vehicles. The cash infusion comes at a critical time for Aston. The company lost about $55 million in 2013 and $41 million in 2012. It also hasn’t released an entirely new model since the 2013 Vanquish, and that car had a slightly modified V-12 engine that Aston has used in other cars for years. Aston won’t debut an all-new model until 2016, when the successor to the DB-9 is expected be revealed. That car will likely use a V-12 engine rather than the turbocharged V-8 that Aston is working with Daimler on.